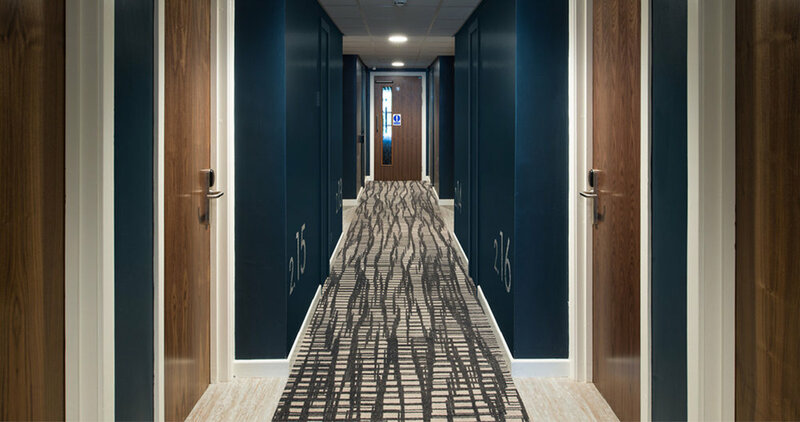 Completed in August 2017, Hadfield Cawkwell Davidson were employed to transform this student halls into a student / budget hotel. Taking influence from similar enterprises in Amsterdam and across Europe, the brief from the University of Sheffield was to create a lively, modern hybrid hotel to accommodate students, academics and visitors to the university under one roof. This brief provided a number of challenges, namely how to offer a pleasant budget hotel experience for short-term stays whilst also delivering everything you would need for a long-term resident. This involved establishing a flexible environment in which the hotel was able to alter its offering according to the guest, creating a great hub where anyone can meet, relax, eat and work. This design mantra effected every decision made throughout the scheme, tables are long with benches to allow numerous and varied people to sit together, workspaces are open but defined and social spaces are designed to encourage interaction between residents. Communal kitchens were also central to the brief, ideal for fostering a sense of shared-space and community. 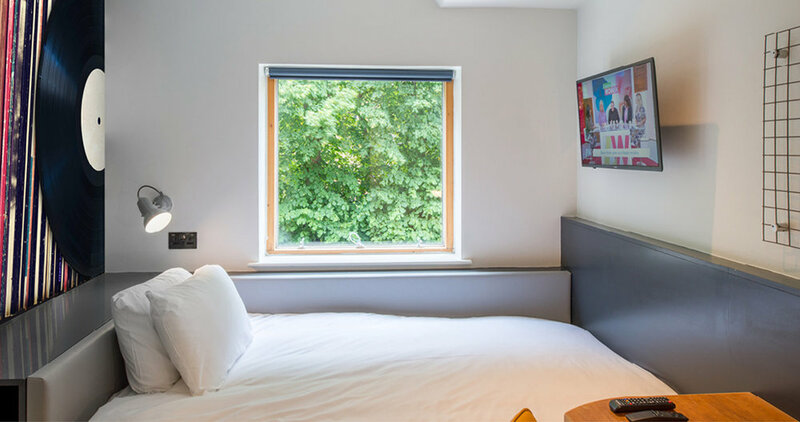 Efficient design of the bedroom layouts was essential to save costs whilst providing a private space that felt spacious and airy. Each bedroom is equipped with modern amenities and is radically different from the average student dorm room. Colourful graphics and contemporary fitting create a room where students and guests alike can be comfortable and generate a feeling of ownership. Additional to the interior overhaul, work was done to add extra parking numbers and in particular to boost disabled parking. PV cells were added to the roof to add a sustainable source of energy to the building as well as branded external signage to set Jonas Court apart from its neighbouring student halls even from a distance.